Customers usually visit websites as their first point of call, therefore it is crucial that your business makes a powerful first impression. 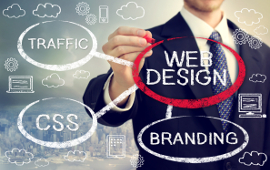 At AHB IT Solutions we focus on producing distinictive and memorable first impression when building websites. We don't just develop your website but provide you with powerful advertising tactics that will assist your site acquire visibility that's required to succeed. We offer our consumers the resources and products necessary to stay one step ahead of competition. A website is only one minor component of the whole picture, as technology moves forward so does the demand for your business to continue to keep up with it. We understand that these days, its no longer about developing a website to stay competitive online that is the reason why it is crucial to not only have a well-designed website but also market your website online and offline. What web development service do we offer?